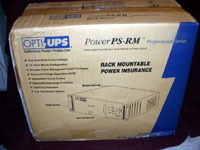 Today we are taking a look at the Opti-UPS SM-B120A-RM Rack Mount 1100VA/1100W 6 Outlet UPS provided by Computergeeks.com. 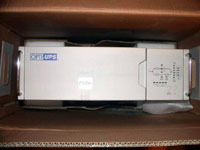 For those of you who are not familiar with a UPS I will briefly explain what one is for, and why you would want one. Basically, it is a big battery that you hook your computer(s), electronics, or anything else that you want into it. When the power either fails or dips, the UPS will switch from direct AC power onto its internal battery power. This does a number of things, such as save you from short power outages, brown outs, and protects your equipment from surges and other nasty stuff that sometimes comes into your house. While I doubt that many people have a 19" rack in their homes (you may at your place of business), I am sure that many of you have nice computers and/or home entertainment systems. With careful placement you could easily place this unit in your stereo/component case or next to your computer system. While you can get floor standing models, many of those units do not have replaceable batteries (specially the lower priced ones). I personally think that being able to swap out the batteries and not have to replace the whole unit is easier, cheaper, and more environmentally sound. While I may not be Mr. Environmentalist, I think being responsible about it is everyone's job. Those are pretty decent specifications for a unit of this price. One thing I really like about this unit is its 4 switchable plugs. This lets you switch those plugs on and off through the software. This can either be a nice security feature (not letting more than what you want plugged into the unit) or can be helpful if your using the unit remotely to hard power off/on a system that is down. But, the unit did arrive undamaged so I guess I can't argue with the results. Here we can see the box, and the internal packing job. This should protect the unit against even the most aggressive delivery driver. Here we see all that is included in the box. 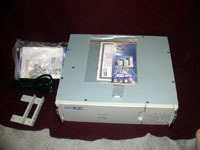 The UPS, 2 rack mount brackets and screws (not for mounting in the rack, just the brackets), manuals for both the software and the hardware, power cord, a serial cable for the UPS & software to communicate, and an extra fuse (nice touch). One thing I had mixed feelings about was the serial cable, sure would have been nice to have a serial & USB cable, but considering how many serial devices we use any more I guess it's ok.